Although copper is often used in subtle combinations of materials for cooking, it particularly falls under the emblematic expertise of Mauviel, a specialized French company that produces exceptional high-quality kitchen products. This Manufacture designs thousands of high-end items for professionals and individuals. The quality of its products has beat out those from many other countries. Even with its success, Mauviel has remained a family business and is still based in Normandy. Created in 1830 by Ernest Mauviel in Villedieu les Poêles in the Bay of Mont Saint Michel, this company continues to employ the copper city’s 800-year-old knowledge and traditions. 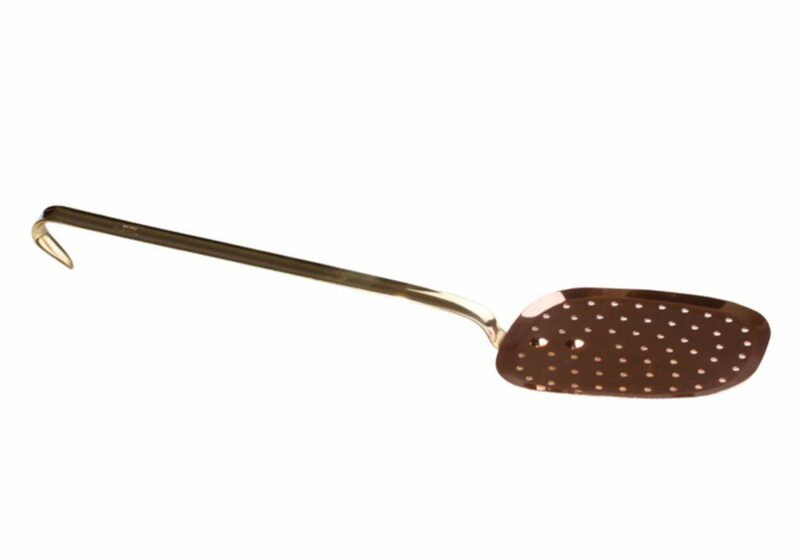 A more or less concave perforated ladle with a long handle, only its name has changed over time: in French, it was first called a ‘friquet’ then an ‘escumoire’ and finally became an ‘écumoire,’ or a skimmer in English. Sauces, broths and jams…since the Middle Ages, it’s been used to skim and eliminate solids, leaving behind a smooth and clear liquid. It is also used to strain food from liquid. We’ve all seen our grandmothers make jam in copper pots. Copper is an excellent conductor of heat and allows for consistent cooking. It has been adapted to our modern lifestyle and was chosen here as a nod to the French culinary tradition. For jams, copper remains the standard. It develops a patina over time, which makes it all the more charming. Regular maintenance with a food-safe product is required to maintain its shine. Delivered in a paper bag.